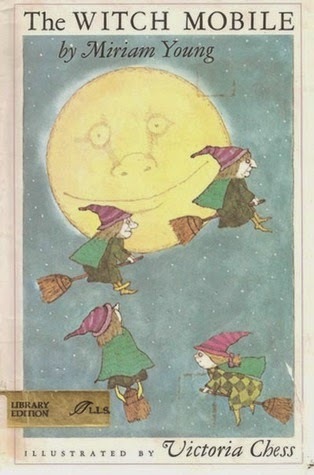 Four witch sisters hang together on a mobile in a toy shop. Three of the sisters have witchy personalities and appearances to match, but the fourth sister, Nanette, looks more like a doll and can't quite bring herself to be cruel or scary. As children examine them in the shop and ultimately select other toys, each of the three witchy sisters vows to exact revenge on Halloween night. For Nanette, though, it is a struggle to truly harm anyone. Instead, her kindness and restraint lead to an unlikely, but welcome, happy ending for herself and a little girl who admires her. This is not quite a chapter book in the sense that is it not divided into chapters and is illustrated more like a picture book. Still, the length of the book makes it a bit much to read in one sitting, and it is probably at an appropriate reading level for second or third graders at the youngest. The story has much in common with The Story of Holly and Ivy. The three witchy sisters are much like Abracadabra the owl, while Nanette and the doll, Holly, share a very similar worldview as well. Both stories also end with neatly packaged conclusions, but neither feels inauthentic or cheesy. The Witch Mobile is a great title to read aloud to elementary school students in celebration of Halloween. In addition to being slightly spooky, it also raises questions about being oneself and doing the right thing in the face of peer pressure that are so relatable for that age group.